Have you heard about Northlink WA and wondered what it’s all about? Here’s what you need to know about construction, traffic changes, and how it benefits our community. Northlink WA is a $1.12 billion infrastructure project funded by the WA and Federal Governments. It will provide upgrades to accommodate Perth’s growing population, and ease congestion on the Great Northern Highway. The infrastructure also builds the foundations for further construction in the future. The project began in early 2016 and finishes in 2020. 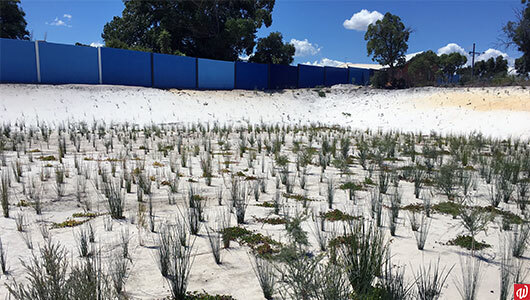 That year our Environmental, Property, and Wholesale Nursery divisions began working with John Holland to provide landscaping and vegetation for the Southern section. So far, the Southern section is on track to be completed in several months. The good news is that most of the construction work is complete, including work around Morley Drive, Benara Road, and Collier Road. Changes have introduced free-flowing traffic and less congestion. Plant installation off Benara Rd in June last year. Our Enviromental team are in the final stages of the project now. 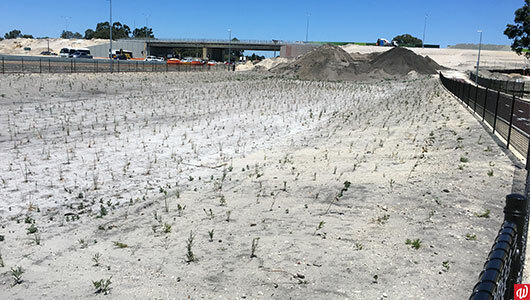 From the 5th June until late August, they’ll be busy installing 260,000 seedlings, 50kg native seed, and 190kg couch grass seed at various sites. All plants are high quality Western Australian native stock locally sourced and grown from our Wholesale Nursery. These landscaping areas have a great benefit to the local community. Not only will they provide a wealth of natural colours and flowers in the warmer months, but they’re from our diverse Swan Coastal Plain region. This adds up to a massive 35 hectares of vegetation in the Southern section alone. Irrigation has improved and will save over 5 million litres of water annually, compared to the previous layout. It’s important to include our WA native species in as many locations as possible, as many can only be found in the Swan Coastal Plain. See the other ways the Enviro team have been protecting WA’s biodiversity. We’ll be following up with the team when the project is complete. Our Wholesale Nursery, Environmental, and Property divisions can meet all your landscaping and project management needs. Contact Alex Growden today to get a free quote at (08) 9375 4950.